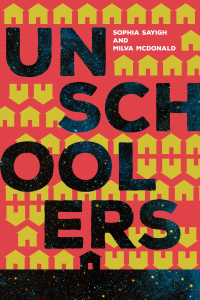 I recently heard from a mom whose husband is on the fence about unschooling because of math. He’s a math whiz whose introduction to the subject came from school, not home. He worries that unschooling won’t offer his kids what they need to develop strong interest and proficiency in mathematics, and they’ll lose the opportunity to pursue careers that involve a high level of math. It’s not an uncommon concern. My kids never went past pre-calculus but their chosen paths don’t involve needing to know more. If they had picked careers that necessitated higher math, I have no doubt they would have learned it. Heck, they might yet change course and do just that. That’s what a friend’s son did when he decided to become a programmer. As a kid he didn’t care much about math, but in his twenties he got interested enough to learn complex math on his own. It’s his perception that as a teen, his brain wasn’t ready to take on the math concepts he’s embracing now. Whether it was a matter of being unable or unwilling, once he started delving into math and programming on his own terms he did it with great success, and more importantly, great excitement and personal satisfaction. One of the main tenets of unschooling is that people are natural learners, which means that learning doesn’t stop at 18. Curious, receptive minds continue to find new fascinations. A recent conversation with my 20-year-old daughter comes to mind. She’s in college and enjoying it very much, but she’s independently acquired an interest in honing her geography skills. Her goal is to learn the names and locations of every country in the world. My 30-year-old son, meanwhile, is busy learning French, and my 18-year-old daughter is teaching herself guitar. One of the great gifts of unschooling is that it helps kids retain enthusiasm for and facility with learning. We’ve all experienced the incomparable excitement that results from learning something we care about, when the tasks required to master a skill feel more like fun than hard work. Remembering that such experiences are available to all of us, for all of our lives, exposes the folly of arbitrary timetables for learning and helps us relax about our kids’ educations. When we fret that our kids aren’t learning or won’t learn a particular subject, we’d do well to remind ourselves that when it comes to learning, it’s never too late, as John Holt wrote in his book about picking up the cello as an adult. Letting go of worry can be a challenge, but as unschoolers we honor human potential and acknowledge that its unfolding is organic and particular to each individual. We know that whether it’s math, music, mountain climbing, or mythology, it can be learned anytime. My always-unschooled son developed a deep interest in math at around 10 or 11. Long story short, in addition to being a math tutor for several years, he ended up with a degree in math, and is now working on writing some math textbooks for math topics that he believes are not taught very well. He has often thanked me for not sending him to school where he would have been exposed to the national nightmare of math-phobia and poor math instruction. As a tutor, he worked with the results of that every day. Math is among the very BEST reasons for unschooling, rather than a topic to worry about. Schools do a particularly poor job of getting kids excited about math. And if a person never does really love math for its own sake, that’s fine, too. Most math taught in schools is soon forgotten and never used, except by people who have a specific interest that requires it. It is a simple task for a person to learn what they need in order to do what they love. Dad’s concerns are quite unfounded. Linda Wyatt is right on. This might be the second worst reason not to homeschool (right after socialization). My previously homeschooled kid chose to return to school in seventh grade, and one of his biggest complaints is how lousy the math classes are. School is really holding him back in math. He may return to homeschooling so he can pick up the pace again. If your kid loves math, there are several curricula it’s very easy to work through at home (e.g. Singapore); there’s Khan Academy, which can help a kid understand new subjects; and for kids who are gifted in math, JHU CTY has summer and distance courses. It’s probably the easiest single subject to manage homeschooling, even for parents who aren’t mathematically inclined. My many years as a private tutor, I’ve seen school kill enthusiasm for math in elementary years. The Common Core has made it even worse. Sometimes I feel like crying alongside the kid as he tackles another dull worksheet on long division. What astounds me is the relentless focus on so-called “basic skills” but never what math is really about. Kids who struggle continue to do so and kids who have a natural talent are usually bored. I also meet a lot of kids who are taking math enrichment lessons outside of school. Go figure.